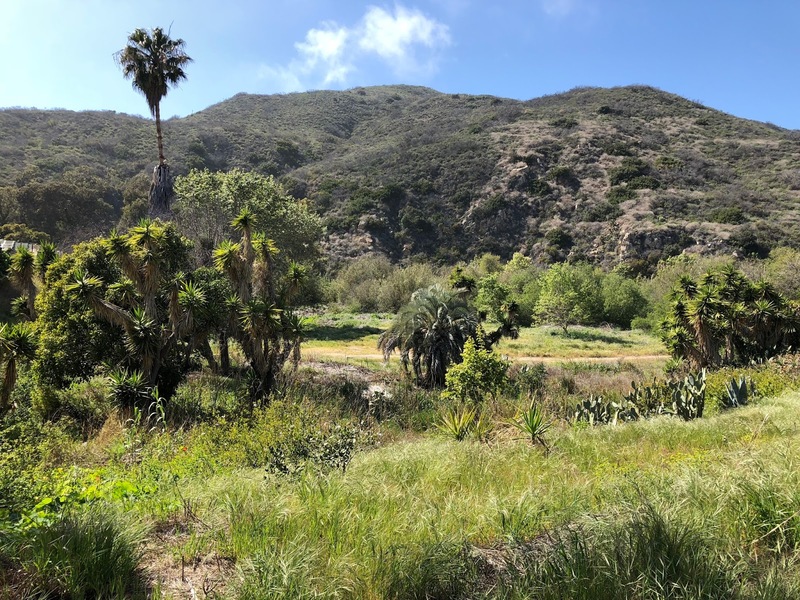 On the last day of the tour we drove out to lower Topanga Canyon where part of the goal was to find the ‘Spiral Staircase’. The Spiral Staircase, as most know, is where Manson and the Family stayed for a time in 1968 and where Diane Lake joined the Family. 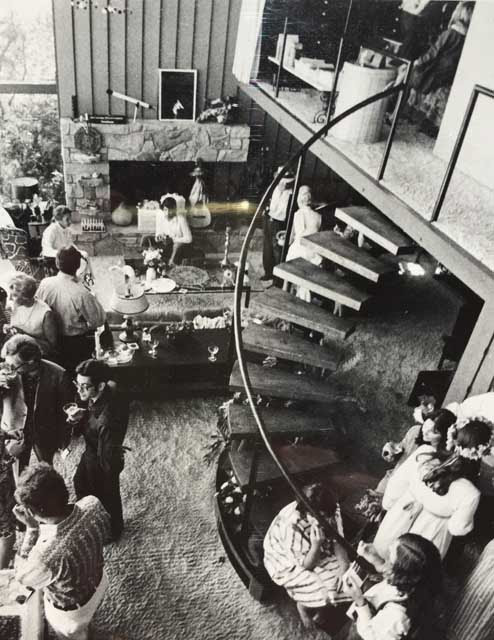 Descriptions of the Spiral Staircase can be found in Dianne Lake’s book and Ed Sanders’ The Family. Lake, Dianne. 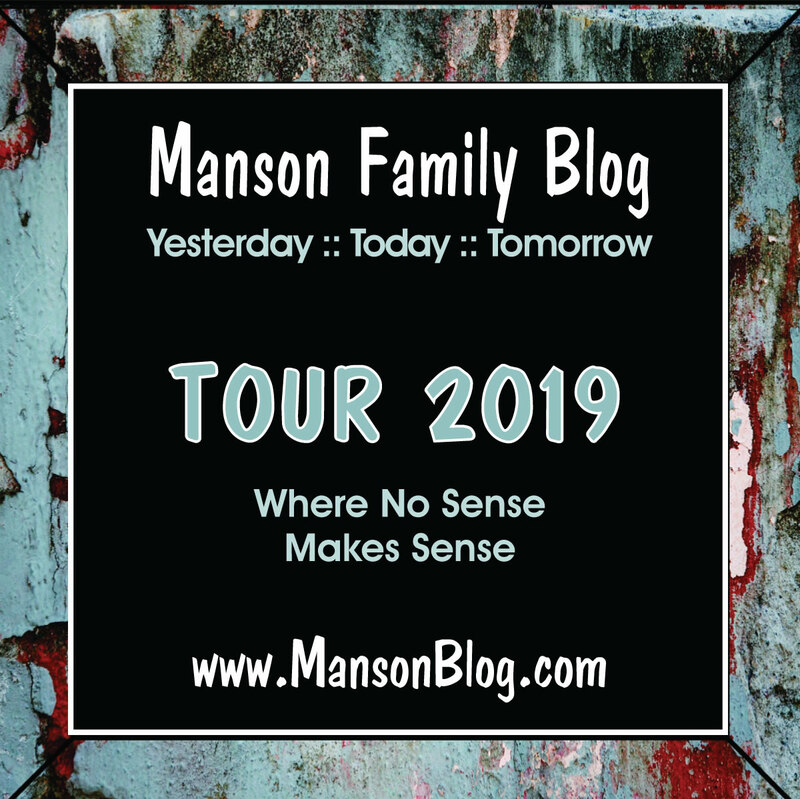 Member of the Family: My Story of Charles Manson, Life Inside His Cult, and the Darkness That Ended the Sixties (Kindle Locations 1751-1754). HarperCollins. Kindle Edition. Ed Sanders, The Family, pp 23, 2002 Edition. There are many legends regarding the Spiral Staircase. 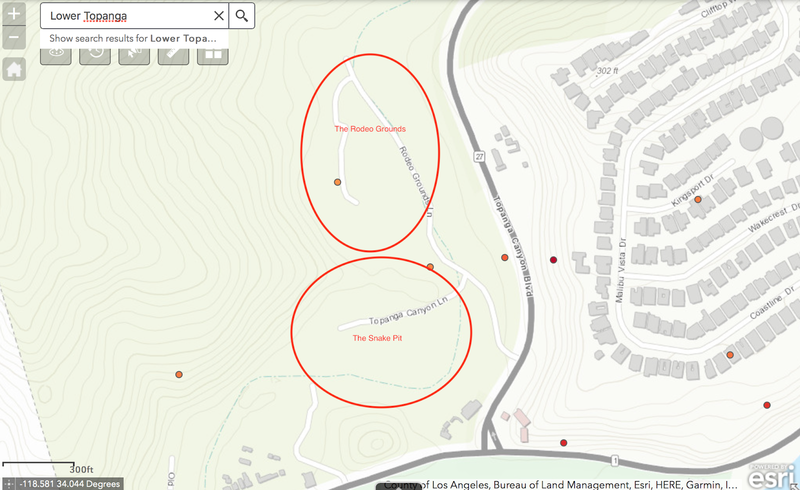 What is known is that it was located in an area in lower Topanga collectively known as The Rodeo Grounds. More specifically, the building stood in a part of the Rodeo Grounds known as The Snake Pit. The Snake Pit got its name from the number of rattlesnakes there and the unsavory types who gravitated to the cottages in the late 60's and after. Local legends claim that devil worshippers, motorcycle gangs and drug dealers once hid in the Snake Pit. The Spiral Staircase stood somewhere behind what is today called the Topanga Ranch Motel. Local legends also claim the Rodeo Grounds got its name from the fact that Tom Mix (a 1920’s cowboy actor) held actual rodeos there for the cowboys who worked the ranches in the region. In 2005 the state of California conducted a historical/archeological review of the area. Part of the objective was to identify any historically relevant buildings in the area before the state bulldozed the cottages down for a state park. That study was unable to confirm the Tom Mix connection. Another rumor claims that William Randolph Hearst (or more likely one of his companies) owned the property in the 1920’s and built an auto court there where his Hollywood buddies could come and spend the weekend. Names like Peter Lorre and Errol Flynn come up in that discussion. 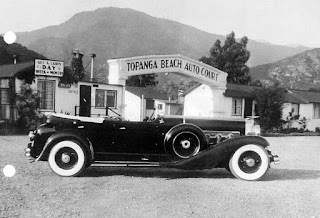 Hearst did not build the auto court (Topanga Ranch Motel) but may have built the cottages along Topanga Lane (in the Snake Pit) that included the Spiral Staircase. One rumor claims the Spiral Staircase was actually a dining hall, dance pavilion and ‘speak easy’. Fact or fiction? Again, the state study could not corroborate those claims. Peter Lorre’s first movie according to IMB was in 1930. Errol Flynn’ first was 1933 so it is unlikely they hung out there in the 1920’s with Hearst. Sometime around 1930 Hearst’s corporation sold the area to the Los Angeles Athletic Club (LAAC) who proceeded to rent the cottages for the next 80 years on a month to month basis to various squatters and other bohemians. By the 1960's there were no formal written leases for the cottages. 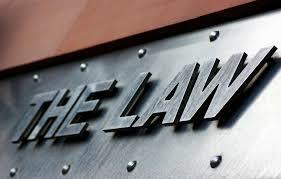 If you moved in to a place you just started paying the rent to the LAAC. The LAAC was an absentee landlord and left the place pretty much alone. In 2001 the LAAC sold the land to the state which in 2006 leveled the cottages in the Snake Pit and Rodeo Grounds converting the area into a state park. Where was the Spiral Staircase? 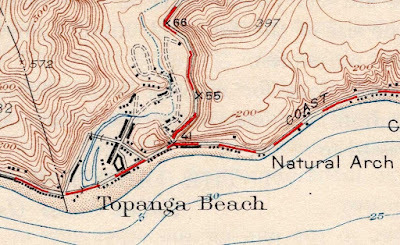 The map at the top is from 1925. The one below that is from the web site, below. 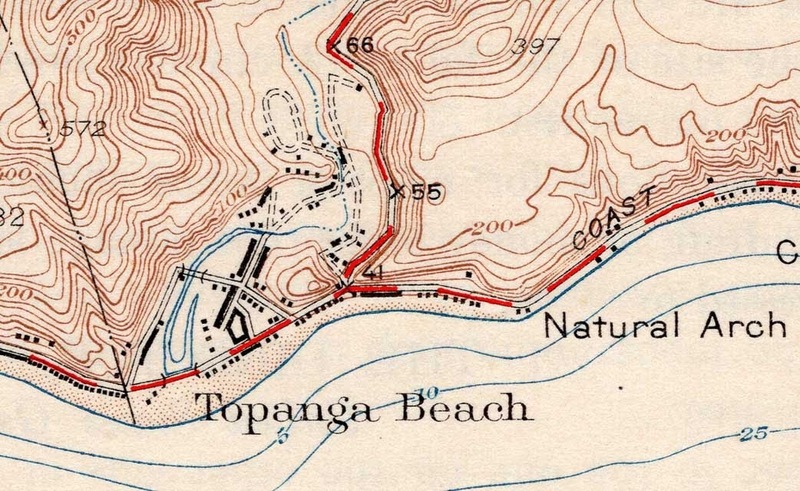 The 1925 map shows the then existing buildings. I marked the Snake Pit (lower circle) and the Rodeo Grounds. Here are a couple aerial photographs. The first is from 1927. 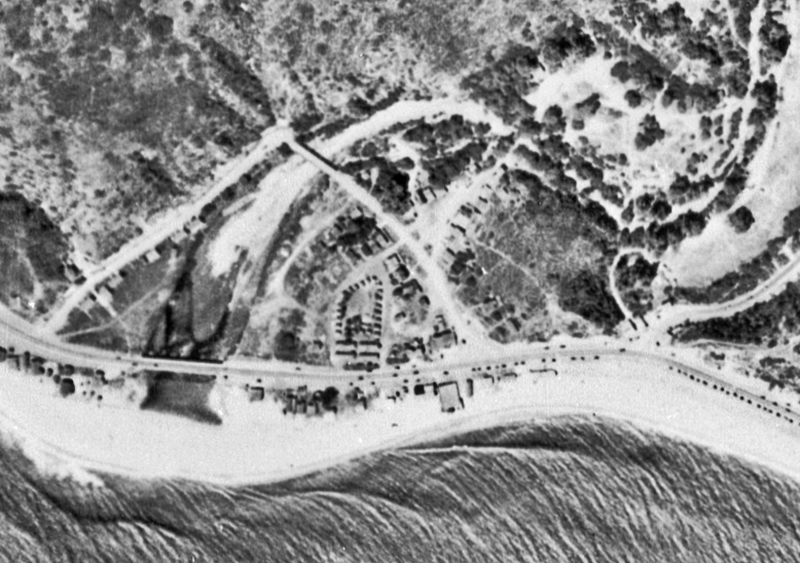 The Snake Pit is behind the motel (the organized buildings in the bottom, center). 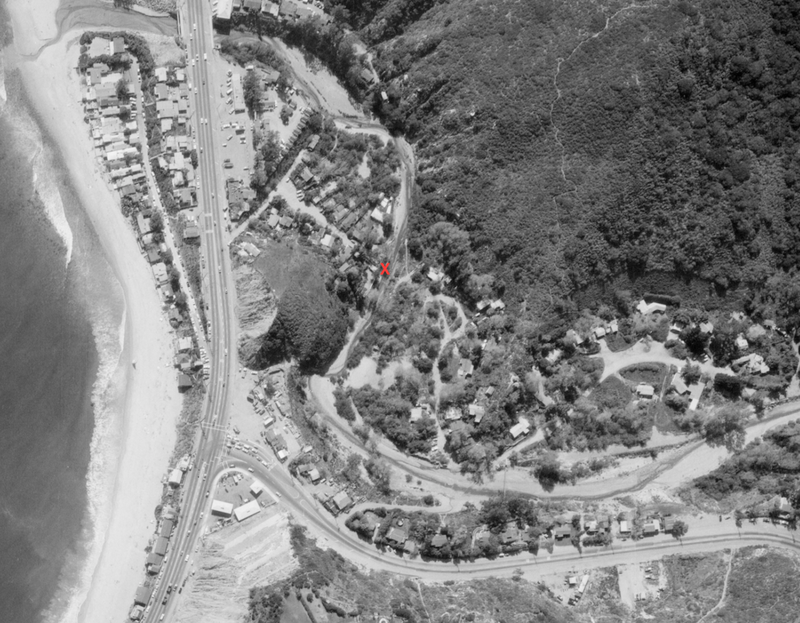 Many of the cottages where there in 1927 which is at least some evidence that William Randolph Hearst did build the original cottages in the Snake Pit. The Rodeo Grounds is the the rectangular area in the upper right. The creek is the snake-like line. Three photos from 1940, 1964 and 1971. I believe the most probable location for the Spiral Staircase is at the “X”. It is at the end of a dirt road (Topanga Canyon Lane) and rather secluded. 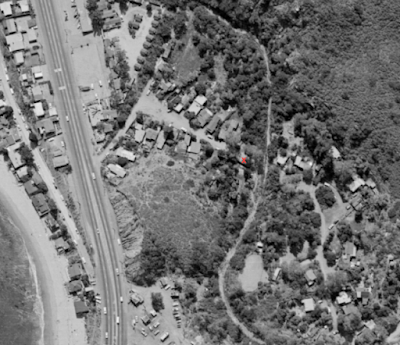 It stands on the edge of the creek and is no longer there in the 1971 photograph. Depending on who tells the story, The Spiral Staircase was either torn down after the January 1969 flood or was washed away during that flood. It has been a personal goal of mine to find an actual image of the Spiral Staircase. I have not been successful to date. One reason may be because only Manson and the Family actually called it ‘The Spiral Staircase’. No local sources use that name, except in connection with a bookstore further up the valley. It could be that the 'Spiral Staircase' is like 'The Yellow Submarine' a Family name for the house. Various sources claim the Spiral Staircase was owned either by a woman named “Ginger” or by a fellow named “Bay Johnson” in 1967-1968. 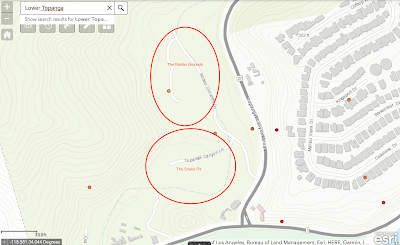 I have not been able to confirm either owner and given the LAAC owned the land from about 1930 until 2001 it is more likely they were renters if they were connected to the property at all. 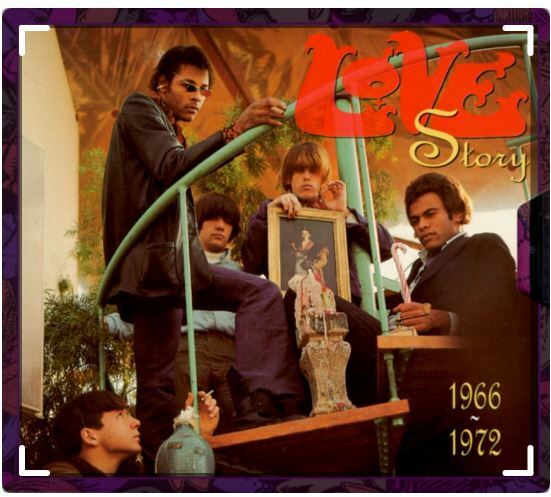 Some have claimed that this photo of the band, Love shows the Spiral Staircase. It is not the Spiral Staircase. This isn't the Spiral Staircase either. That is not sand. It is shag carpeting. Nor is this bookstore further up the canyon the actual Spiral Staircase. 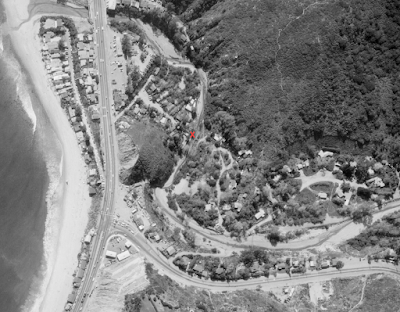 The manager claims that about once a year someone stops there asking about the Manson house. 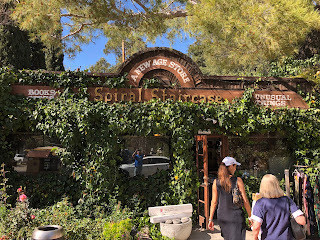 Although the bookstore was likely named after the Spiral Staircase, the manager insists, if he is asked, that the name has nothing to do with Manson. In fact, he gets rather defensive when the subject comes up (we asked him). Has anyone ever thought of asking Dianne Lake? Surely she would know where it was and possibly the address. Very cool and informative post!...Has anybody managed to ascertain exactly where the Raft Restaurant, as per Ed Sanders book, was located? 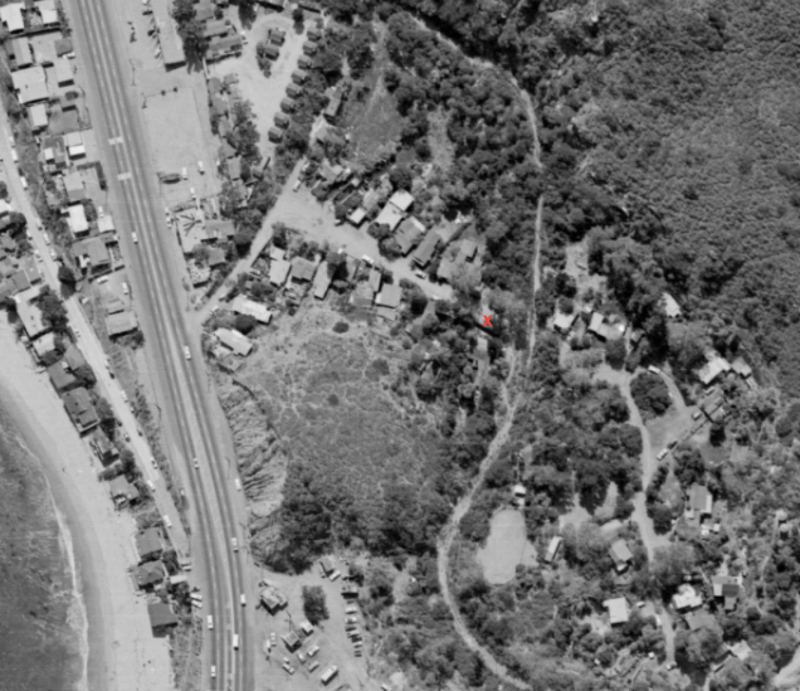 One of the best things about this post is the red marking on the vintage aerial photos pinpointing the house's presumed location.....maybe someone could also insert a marker showing where this restaurant was. The Raft is now the Reel Inn. 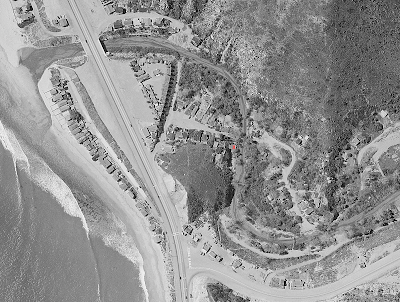 Look at the images at the Topanga Canyon Lane entrance from PCH (Highway 101). Just north (above) the entrance there is a small, square, building. Just north of that there is a larger rectangle building. That is the Reel/Raft. I had to look it up Brownrice: A furphy is Australian slang for an erroneous or improbable story that is claimed to be factual. Furphies are supposedly 'heard' from reputable sources, sometimes secondhand or thirdhand, and widely believed until discounted. Brownrice, Sanders referred to the woman who had the Spiral Staircase as "Gina". Dianne's recollection of the woman being named "Ginger" fits right in with a red-head but I wonder if that was a nickname due to her hair color. Reading briefly about the 'spiral staircase' in Dianne's book reminded me of my favorite scary movie, the early 60's version of The Haunting (spiral staircase in the library), yet I would have liked to have seen it new, then just before it was torn down. Mr H, I didn't realise it was australian... I wouldn't have used it if I'd realised it was localised. I've travelled a bit and generally try not to confuse things by using regional lingo in the wrong region :-) ...but yeah that's a very good description of what a furphy is. Was Ed Sanders himself a member of the occult? 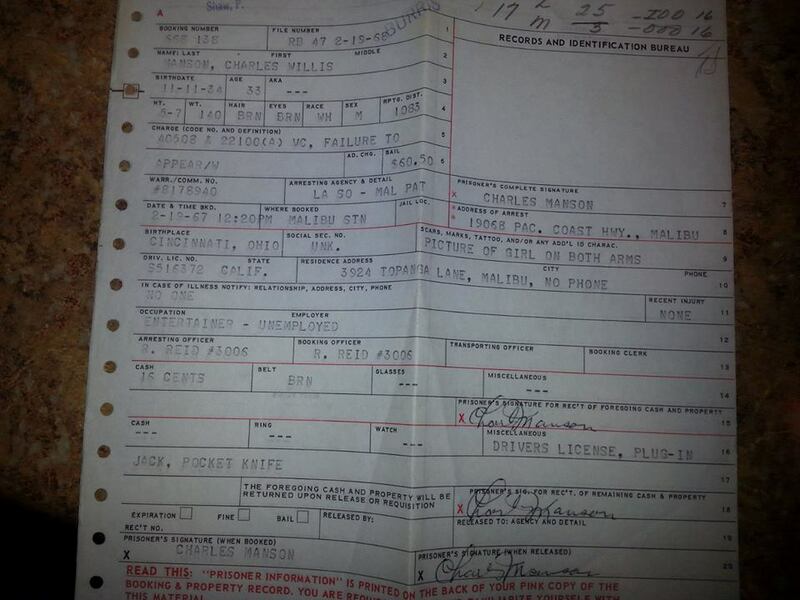 Noticing on the arrest report that Charlie is 5'7". Charlie could be any height he wanted to be. Brownrice, interesting I like the word furphy and like it when Australians and Brits use their regional expressions here. Thanks for looking into this subject David. I already forgot how Dianne Lake says she got her nickname, but it's funny the Family met her in the Snake Pit. The Academy of Motion Pictures Arts and Sciences expels Roman Polanski after what, 40+ years since his crimes? They should get an Oscar. Hmmmm ... Donald Furphy Trump. It kind of has a nice ring to it. Yeah Matt it took them a while to get to it. I guess they finally got caught up in the Me Too tide. @Matt, was the thinking well since we're already expelling Cosby, might as well toss Polanski in too? 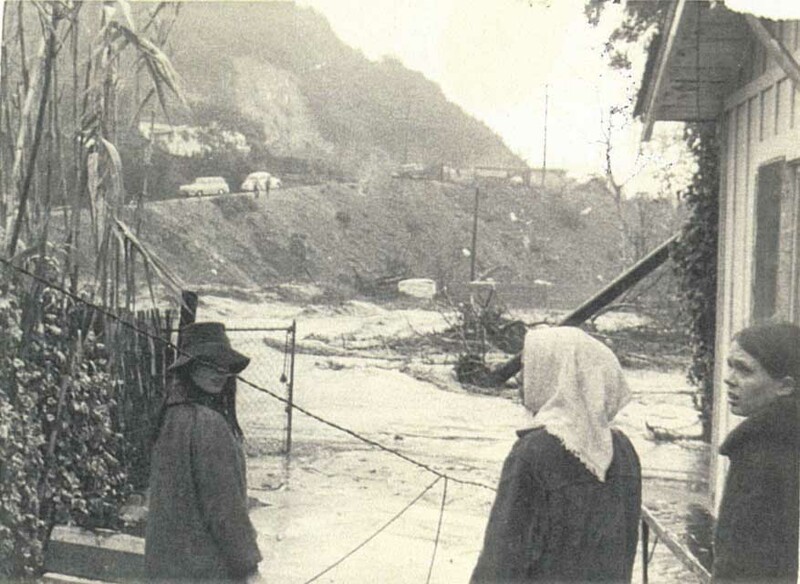 I wonder if the flooding in January 69 is what knocked the house off its foundation. I wonder if it was a hazard to occupy, how askew was it? Wacky times. 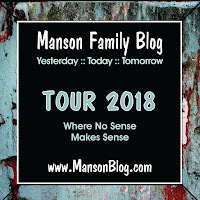 The whole manson case is shrouded in Furfuendo. Farfuendo!!! Thank you for the laugh. Where the heck has he gone? I have also heard about the owner being named Jean and possibly being Georgina Brayton. 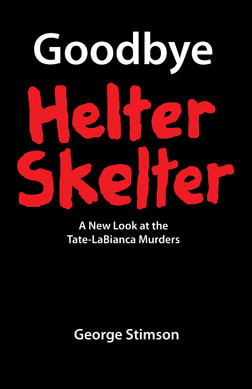 I read in Frater Shiva's book that Watson not Manson was seen at a OTO meeting put on by Brayton and her husband. I have also wondered about the characters hanging out at the Spiral Staircase and would like to hear the folklore of the Snake Pit. Thank you so much for this post. I am continually fascinated by this house and its sordid history. I wish there was more information available. But between the book by Dianne Lake and this post by you I am truly grateful for the new information I have discovered. Thank you! I did a story in a comic book anthology called "Satanic Mojo" issue number 1 about the Spiral Staircase. It is a short comic called "Adrift in The Fathomless Snake Pit". At thr time I wrote and drew it all the info I had came from you and Adam Gorightly. I contacted him for more stories regarding the house but he responded and said he had hit a dead end in his research as well. Thank you again and I really enjoy reading the comments on here. Endlessly informative.